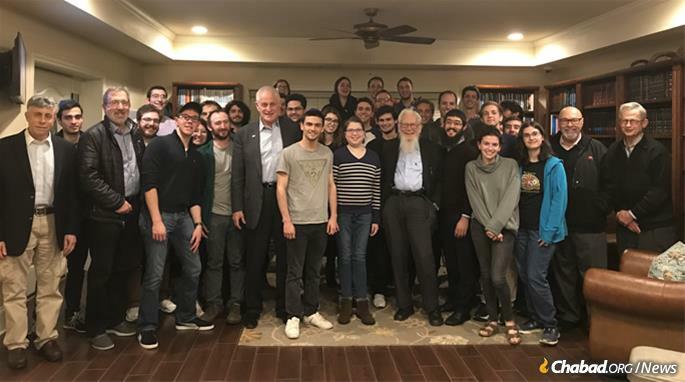 Nobel laureate Robert Aumann with students at the Rohr Chabad House at Georgia Tech and Georgia State. 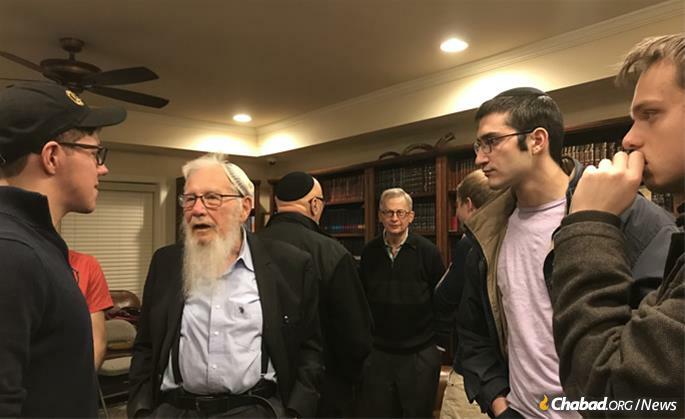 Students and professors at a campus Chabad in Atlanta were treated to an intimate engagement with Nobel laureate Robert Aumann after threatening weather landed the Hebrew University professor, known for his contribution to game theory and economics, at the Chabad center rather than at an originally planned larger school-based event. Following the cancellation of a program scheduled to take place in the university’s business auditorium due to threatening snow and sinking temperatures last Tuesday, Rohr Chabad House at Georgia Tech and Georgia State Chabad-Lubavitch emissaries Rabbi Shlomo and Shifra Sharfstein, thinking on their feet, put out a call through social media to reroute a smaller version of the event to their institution. 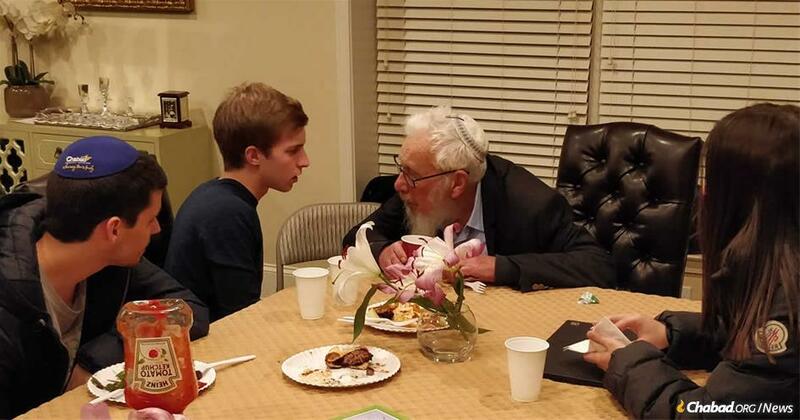 One of those present was Meira Robbins, a junior neuroscience major at Georgia State, who had attended at least one other event in the past at the Chabad center featuring an eminent university scholar who was also a Torah-observant Jew. “It was nice to see another example of a Torah-observant Jewish person who sees reason in science and the world we live in, and how they can go together and co-exist quite nicely,” she said. Zachary Zwick, a junior majoring in industrial engineering at Georgia Tech, said he, too, marveled at how Aumann saw the unity in seemingly disparate fields. Students, faculty and alumni gathered for the last-minute event. Aumann, 88, an observant Jew and ardent supporter of Israel, won the Nobel Memorial Prize in Economic Sciences in 2005, sharing it with Thomas Schelling, for their work on conflict and cooperation through game-theory analysis. In general, game theory applies mathematical models and psychological insight to arrive at the best choices that participants in any game, conflict or process can make, based on calculations of what the other side might do and assuming that all involved will make rational decisions. The discipline is applied broadly in fields ranging from economics to international politics to labor dispute and other forms of arbitration and beyond, with Aumann showing how the modeling tools and insights can be applied in areas as far-flung as talmudic discussions and parental negotiations with children. As part of his hour-and-a-half talk, Aumann provided a real-life example of the latter by sharing how his mother in the aftermath of his family’s emigration from Germany to the United States in 1938—going from rich to poor in the transition—would provide incentives for agreement among he and his brother in arbitrating the splitting of a paltry piece of cake. She would give the entire piece to one, asking him to cut it in two equal parts, and then have him ask the other to choose which part he wanted—all in the name of maximizing mutual satisfaction and minimizing conflict, which is the perpetual aim in game-theory applications. Aumann earned his master’s degree and doctorate in mathematics at the Massachusetts Institute of Technology in 1952 and 1955, respectively, joining the mathematics faculty at Hebrew University in 1956. Despite losing his first wife to cancer in 1998 and his oldest son in the 1982 Lebanon War, he ended his talk on the devotional theme of gratitude, rather than on a scientific note. Aumann shared with the rapt audience that while praying the morning service, he focuses in particular on the prayers related to thanks, having in mind the successes G‑d has brought him throughout his life. “It was nice to see another example of a Torah-observant Jewish person who sees reason in science and the world we live in, and how they can go together and co-exist quite nicely,” said one student. Economics and the freedom of choice I have been trying to attract Professor Aumann's attention in past years in order to show him my recent theory of macroeconomics which turns it into a science, but so far no joy. Perhaps one of his "defenders" of his electronic mail will recognize that I really do have a contribution to make in my "tikun olam" attempt here. Try to present it to some other academics, if it is a good idea he will hear about it.